As you can see, kidneys have numerous important functions in our body, so it’s essential that we keep them functioning properly. Usual symptoms of kidney issues include: changed quantity and color of the urine, vomiting, dizziness, breathing issues, anemia, fatigue or tiredness, bad breath, feeling cold most of the time, sudden pain in the body, and itchy skin. Consuming too much salt on a regular basis can lead to serious kidney damage and other health issues as well. 95% of the sodium consumed through food is metabolized by kidneys. If you consume too much salt, your kidneys will have to work much harder in order to excrete the excess salt. This can result in reduced function of your kidneys, leading to retention of water in your body. Water retention can increase blood pressure as well as the risk of kidney disease. According to many studies, the intake of salt raises the quantity of urinary protein, which is another risk factor for developing kidney disease. Every amount higher than 5 grams a day is harmful to both, kidneys and your general health. One teaspoon of salt is approximately six grams. Many people take analgesics, or over-the-counter painkillers, to lower inflammation and fever, and to control pain. However, this habit can cause damage to kidneys, and on other organs as well. According to research, over-the-counter analgesics can decrease the blood flow to the kidneys and worsen their functioning. Long-term or heavy use of analgesics causes acute kidney injury or interstitial nephritis which is a chronic kidney disease. Excessive intake of protein-based foods like red meat can raise the risk of kidney disease. Kidneys have another important role, and that is to metabolize and eliminate nitrogenous wastes from the body, which are by-products of the protein digestion. High intake of protein chronically raises the glomerular pressure and hyperfiltration, thus increasing the metabolic load of kidneys, which increases the risk of developing kidney issues. If you drink excessive amounts of alcohol, the uric acid will be stored in the renal tubules, causing a tubular obstruction which raises the risk of developing kidney failure. Furthermore, alcohol leads to dehydration and impedes the normal kidney functioning. The healthy amounts of alcohol consumed on a daily basis are 1 drink for women and older people, and 2 drinks for men. Smoking is not only bad for kidneys, but for almost every organ in our body, as stated by the Centers for Disease Control and Prevention. The relation of smoking and kidney disease has been shown by many studies. As the American Association of Kidney Patients (AAKP) explains, smoking is the number one cause for ESRD (end-stage renal disease). Smoking increases the heart rate and blood pressure, as well as decreases the blood flow and narrows the blood vessels in kidneys. This unhealthy habit can aggravate existing kidney disease and can speed up the loss of kidney functions. The best way to prevent this is to stop smoking, as this habit is harmful to every part of your body. If you consume too much caffeine, your blood pressure will be increased, which will burden the function of kidneys. Over longer periods, this can cause kidney damage. Kidney International has published a 2002 study according to which the consumption of caffeine is strongly related to kidney stones. Caffeine can raise the excretion of calcium in the urine. Ignoring coughs, colds, flu, tonsillitis, pharyngitis, and other common infections can cause serious kidney damage. Those with kidney disease have often reported to had no rest when they have been sick, and these are often weather-sensitive people who often get ill.
A lot of people ignore the importance of proper sleep because of their busy lifestyle. A 6 to 8-hour sleep is crucial for a person’s overall health. The organ tissues renew while you are sleeping, so if you don’t get enough sleep you will interrupt this process, which will lead to damage of many organs, including the kidneys. According to many studies, improper sleep can cause increased clogging of the arteries (atherosclerosis) and high blood pressure, which raises the risk of kidney damage. Always try to keep a good balance between work and rest, and to adopt healthy sleeping habits. 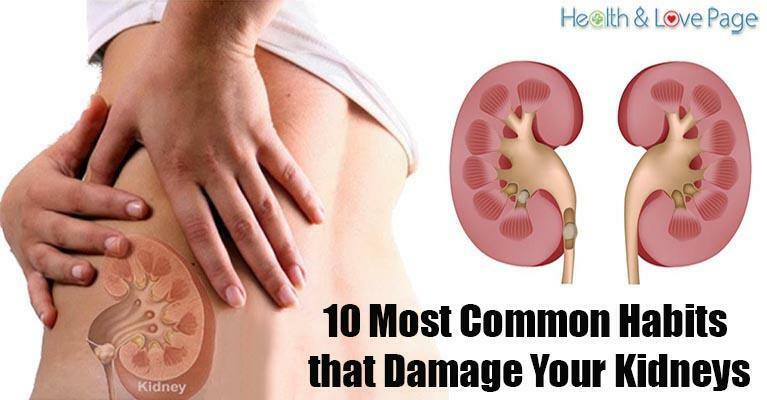 In this way, you will protect your kidneys and your overall health.